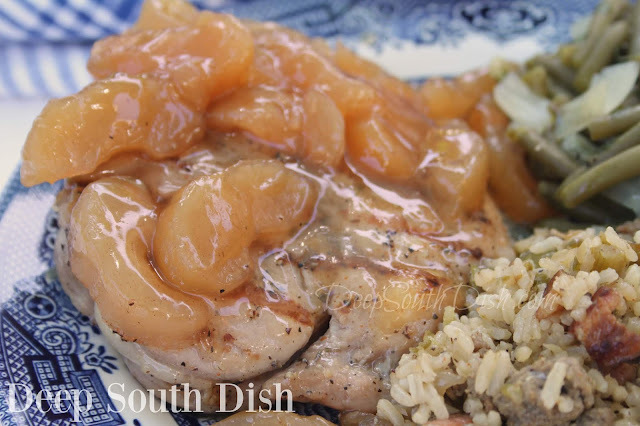 Thick-cut brined and seasoned pork loin chops, topped with skillet fried apples, or a homemade or canned apple pie filling, and baked in the oven. I can't recall where I first saw this idea to combine pork chops and apple pie filling, but I thought it sounded great and turns out I had a can of apple pie filling in the pantry I needed to use up! I'm sure that I bought it for a very specific reason, now long forgotten. I'm terrible about that, to the point that now, when I buy supplies for the pantry to use for a specific purpose later, I tape a sticky note to it! Now I have notes all over the outside of my deep freeze and a bunch of them stuck on top of canned goods in my pantry. Hilarious, I know, but hey... I ain't gettin' any younger y'all! Anyway, I was right. Apple Pie Pork Chops are pretty yummy! While you may not automatically think of the combination of fruit with meat, there really are some great match-ups to be made and I'll bet you've even eaten some of them, without even thinking about it. Grapes and apples make a rocking chicken salad, lemon loves poultry and pineapple also pairs beautifully with any kind of chicken. Pineapple is even delicious with beef. Cranberry and turkey are a classic match, as are figs and prosciutto. Pork is delicious with peaches - and apples! I mean there's a reason Cracker Barrel sells a lot of fried apples as a side dish y'all! Since I'm using a much thicker chop from what I use in most of my pork chop recipes, because that's what I happened upon in the freezer, I highly recommend brining them. Not only does it add flavor of course, but it also gives you a little bit of insurance from overcooking what today has been bred to be a very lean pork chop. This is also a good place to use your blade tenderizer to infuse the brine and seasoning and eventually the flavors of the apple pie filling. Whisk together the brine ingredients listed in the recipe below. Place chops into a zippered storage bag and pour brine over, These were about an inch thick, and can be brined in the refrigerator for 4 to 6 hours, or up to 12 hours. Preheat oven to 375 degrees F. Remove chops from the brine and discard brine. Pat chops dry and season with black pepper and cayenne. No salt is needed unless you have chosen to skip brining. If so, you'll want to add salt to your seasonings. I'm using my table top grill to get some nice grill marks and then transferring to one of my lidded Copper Chef pans for the oven. You can also just pan sear them on both sides. Pour canned or homemade pie filling, or a batch of cooked, skillet fried apples, over top of chops, cover skillet and transfer to oven. baking for about 30 minutes, or until internal temperature reaches 145 degrees F. Total time will depend on thickness of chops so make adjustments as needed. A very simple recipe and something a little different to try! I served mine with quick fix green beans (made from cut canned beans) and "undirty" dirty rice (because I only used ground beef and not the "dirty"). Enjoy y'all! For more of my favorite pork chop recipes, check out the collection on my Pinterest page! Whisk together brine ingredients. Place chops into a zippered storage bag and pour brine over, sealing tight. Place into a bowl and refrigerate overnight, or up to 12 hours, turning occasionally. Preheat oven to 375 degrees F. Remove chops and discard brine. Pat dry and season with pepper and cayenne. Heat oil in an oven-safe, lidded skillet, add pork chops and sear on both sides. Pour pie filling over top of chops, cover and transfer to oven. baking for about 30 minutes, or until internal temperature reaches 145 degrees F. when an instant read thermometer is inserted deep into the side of chop. Total time will depend on thickness of chops. Cook's Notes: This is a good place to use your blade tenderizer to infuse the brine and seasoning and eventually the flavors of the apple pie filling into your chops. You may substitute a thinner cut of pork chops at least 1/2 inch thick, adjusting time down accordingly. May also use your own homemade pie filling or prepare a skillet of my fried apples. I just stopped by to comment on your Breakfast pork chop recipe, which was delicious, by the way. Pork and apples go together like hands and gloves. I have some 1/2" pork chops in the freezer. I've never brined a pork chop, but there is a first time for all things. Plus its an excuse to make those wonderful fried apples. These are on the menu for Sunday dinner. Those are some pretty grill marks on those chops!